At Inspired Teaching one of our favorite interview questions for potential employees is: “How do you take feedback?” Feedback is something we expect everyone who works with us to give one another on a regular basis. We consider it to be essential to our growth as individuals and as an organization. This belief reflects our efforts to practice what we preach. We believe the art of teaching is one of continual reflection, readjustment, and improvement. Feedback is key to the process of becoming an Inspired Teacher. Even though I know this now and consider feedback an important part of my work, whenever I interview a candidate who says, “I LOVE feedback” I am suspicious. This reaction comes from my old relationship with the term. Before joining Inspired Teaching I always thought of feedback in the negative and, to be honest, I still cringe whenever someone tells me I’m doing something wrong. Nobody likes to be wrong, but growing up I never considered the critical connection between acknowledging mistakes and growing as a person. In my first professional role as a teacher I was no less afraid of having my errors laid plain on the table. Maybe because I’m the big sister in my family, I just simply never wanted my flaws to be publicly recognized. So, when I was asked, “how do you take feedback?” at my interview with Inspired Teaching I’m pretty sure I lied and said, “I love it.” In my few months working with the organization my colleagues gave me feedback on pretty much a daily basis. Every time they shared a concern I went home and melted into a pool of embarrassment and self-pity. I know I got an equal balance of positive feedback from them as well, but it was the negative that I noticed most. Eventually I started spending more time in our training sessions where we constantly ask teachers to reflect on their practice and to offer feedback to one another. I learned about our mentoring program, which is built on the art of giving feedback. I took the Inspired Teaching Institute and learned about giving and receiving feedback to and from your students. Gradually I stepped outside of my ego and looked at the effect all the feedback from my peers was having on my growth as a person and a professional. It was hard not to notice that I’d achieved more in my time at Inspired Teaching than at any other non-profit job I’d ever held. It was also hard not to notice the genuine and rich relationships I now had with my colleagues. And at the end of the day I realized that an environment that required us to give constructive feedback to one another was responsible. Now when I teach teachers I actually look forward to the feedback I get from them at the end of each class. When they ask me to bring more clarity to the next session I look forward to the challenge. When they say they need more activities and resources I set to work finding them. Every time they share their observations and opinions, I become a better facilitator. I’d still be lying if I said I LOVE getting feedback, my ego still rears its ugly head from time to time and it takes awhile to lose the sting of a critique. But what I do love about feedback is what it’s done and continues to do for my growth. Why is science so cool in school? There was the science room in elementary school where we could touch frogs and taxidermied skunks. There was Mrs. Stemler’s dissection of a pig uterus in middle school. And all of my most potent high school memories come from biology, chemistry, and physics. As a high school English teacher it did not escape my notice that the most memorable things were still happening in the science wing of my building. I married a science teacher and for years I’ve seen that his dinner-table school-stories are way more engaging than mine. This has prompted me to wonder, why is science so cool in school? I think it’s because the root of science as a study is inquiry and inquiry requires problem-solving and an active approach to learning. By its very nature, the subject of science requires inspired teaching – especially if teachers build their instruction around the scientific method and use exploratory experimentation as the foundation of their curriculum. While there is plenty one can read about science in textbooks and magazines – the subject lends itself so well to hands-on investigations of every concept learned. From the kindergarten grow-a-lima-bean experiment to the high school physics matchbox-car-derby, there are a million and one ways teachers can bring exciting experiments into the classroom. But why should science teachers get to have all the fun? No matter what subject you teach, there’s probably some way you can link your curriculum to the fun of science. Students can read about the latest scientific discoveries in English and discoveries of the past in History. They can write biographies of famous scientists, or perform an experiment and practice writing directions to describe how the experiment was done. Experiments that require measurement obviously involve math. Physical education can easily lend itself to experiments that study heart rate, speed, and even the biological wonder of how we turn food into energy. Art teachers can revel in the beauty of nature and tie into math as well as they look for geometric patterns in the growth of all living things. Lots of voices in education seem to believe that the only way to turn low-performing schools around involves big, top-down initiatives. While the role of excellent leadership can’t be underestimated, there is plenty of evidence that the key ‘lever’ to change is teacher quality. A good example of the essential role of investing in teachers is in the Benwood schools in Chattanooga, Tennessee. The Benwood schools went from among the 20 worst-performing schools in the state of Tennessee to acclaimed models of success. 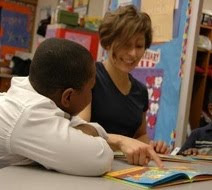 The results are impressive – in the eight targeted schools, student achievement has jumped 27 percentage points on state reading tests, well above state and district averages, teacher morale is up and teacher turnover is down, and an analysis using William Sanders’ Tennessee Value-Added Assessment System shows significant gains in teacher effectiveness. Simply put—the students learned more because the teachers got better. So what made it happen? Both Benwood reformers and outside analysts acknowledge that there were multiple factors that led to the changes, but as Elena Silva at Education Sector explained recently, the success can ultimately be ascribed to the fact that the reform was teacher-centered and partially teacher-driven. Instead of taking an ‘out with the old and in with the new’ approach (firing under-performing teachers and relying on new hires to create change), the Benwood Initiative invested in the teachers it already had, providing ongoing professional development focused on high-quality classroom instruction. The most high-profile of the Benwood reforms was a financial incentive plan, established by local business leaders, and designed to attract top talent to Benwood classrooms. These incentives, which included help with mortgages and graduate school payments, as well as performance bonuses, appeared in the press, government proposals, and policy papers nationwide. Yet only 5% of teachers actually participated in the incentive plan. Silva concludes that the impact of financial incentives was "overstated" and that reforms that focused on existing teachers, such as mentoring, collaboration, and feedback, were at least as successful as trying to bring in new talent, if not more so. In an ultimately successful move, the district superintendent asked Benwood teachers and principals about their needs and opinions, and then listened to what they had to say. As a result, teachers soon had "mentor and peer support, constructive principal feedback, and more time for instruction and lesson preparation." The district brought in consulting teachers, leadership coaches, and additional staff such as reading specialists, and fostered an improved relationship with the union. This new atmosphere of collaboration, support, respect, and progress led to more satisfied teachers, better schools, higher-performing students, and a more effective administration. There are many lessons to be taken from this. As Silva affirms, "teacher effectiveness isn't fixed." Instead, supporting and inspiring teachers to challenge themselves is not only possible, but essential to building better schools. Teacher-centered reform should not mean mass firings and new hiring, but helping teachers become more effective, and allowing those teachers to have a voice in the reform process. Thanks to Research Assistant Rebecca Shinners for researching and drafting this post.